The new ADA MP-1-CHANNEL pedal clones the classic tone of the original MP-1 rack mount guitar preamp. The MP-1 Clone. Imagine having the classic ADA MP-1 tone available on your pedal board. 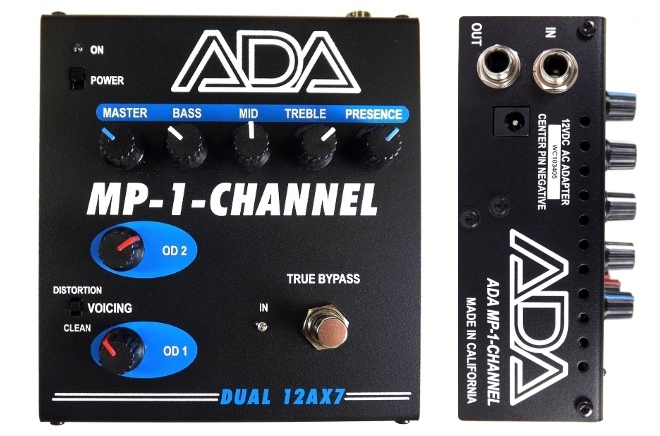 The new ADA MP-1-CHANNEL is a pedal version of the renowned MP-1 rack mount guitar preamp. The MP-1-CHANNEL employs the 4-stage vacuum tube design taken from our ground breaking MP-1 MIDI TUBE PREAMP to achieve the same rich tone that made it the staple for most of the touring bands in the late 1980s and early 1990s. The small package, a 12-volt power requirement and a true bypass switch make the MP-1-CHANNEL easy to integrate into your pedal board system. Put the warm sound of tubes on your digital tracks. Take a listen or plug in now. In short, we shrunk the package, but kept the tone. Check one of the many online videos or visit an ADA Dealer to hear how good a pair of tubes can make you sound.